I used to have a website for our dogs, even though I have never bred a litter and don’t compete in shows or trials very often. I’ve actually had the kennel name domain since 1998, and the site was started a couple of years before that. I stopped maintaining and updating it a few years ago when two of our older dogs passed away. When Freya came to live with us in January 2004, I thought I’d resurrect the website. I tossed some ideas around in my head, and even went as far as making Photoshop comps of one of them, but I still didn’t get the website back online. When Axel came to live with us in January 2007, I went through that whole process once again. Still no website. As you know from yesterday’s post, Freya is now five years old. Axel’s second birthday is coming up in a matter of days. I’m not sure why it’s been so hard for me to get motivated to put something new up for myself. I do maintenance and updates for a few dog club/organization websites, and my husband’s motorcycle club’s website. 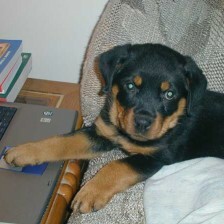 I also designed and maintain Axel’s breeder’s website, and a website for another breeder friend. But when it comes to my own site, I have the equivalent of writer’s block. Or maybe that should be designer’s block, or coder’s block. I know, I know… I should stop overanalyzing my designs and just go ahead and do something, anything. So who is going to slap me to my senses and help me sort pictures of Freya and Axe? This time it’s not self-inflicted, like it was earlier in the month. My older relatives have all refused to get cable or satellite television, for a variety of reasons, some good and some extremely bad. This has made our task of getting everyone ready for the switch to digital television approximately 100 times more difficult than it needs to be. We have not been entirely successful at getting across the very important concept that if you start out with a weak and crappy signal, it will not get better, even when fed into a brand new HD-ready Sony Bravia. The visual evidence is pretty strong but it’s getting a bit (ok, more than bit) frustrating that the point has still not quite hit home. The idea of blogging from vacation is probably not my most brilliant one ever. Today was not spent enjoying sea and sun and other typical Hawaiian vacation things. Since TV is going 100% digital in February 2009, and my dad is total analog man, it’s up to me and my husband to leave my folks’ house digital-ready before we go. I am sure I am not the only one who has had to fight past parents’ reluctance to adopt technology. There is no cable or satellite TV in this house. I am not completely sure why my dad is so adamantly against getting it. He usually blames me, for a variety of reasons going back to when I was about five years old that are so absurd that I will not put them in writing. To add to the fun, Hawaii is going all-digital a month before the rest of the country. I can totally get behind the reason for doing so. The dismantling of the analog broadcast facilities needs to be completed before the nesting season of the Hawaiian petrel on Maui. I’m all for saving birds and their habitats. But this means we have to get the digital converters installed on this trip for my parents and two of my aunts. This burden falls mostly on my husband because my technology smarts are limited mainly to computer matters. I’ve done my part there. I’m typing this on my mom’s year-old iMac which is connected to the ‘net via wireless high-speed broadband. She is not nearly as analog as my dad and actually uses this computer quite a bit. Hopefully tomorrow I’ll actually get to somewhere more scenic than Sam’s Club and Best Buy, and have a tale more exciting than one of dragging reluctant people into the 21st century. Once again, a fond Aloha!